It's not that I entirely disagree with the decision; a couple years ago I went and looked at the old slide myself and saw some rather scary holes that rust chewed into the old relic. I disagree with one of the primary reasons why this piece of fun and functional history has to be taken away. What has me more upset is that the article states the slide is too damn tall to satisfy the "safety nazis", and thus can not be "insured through the League of Minnesota Cities" regardless of whether it's structural shortcomings could possibly be dealt with. I would bet more kids probably got hurt crossing streets just to get to the slide over the last nearly 60 years than were ever actually hurt on the damn thing! Gee, how ever did we manage to live this long without the paternal guidance of lawyers, insurance companies, governing bodies and activists? Today society acts based on a "well this could possibly happen therefore we must ___" train of thought, rather than asking what is likely to happen or what has actually happened before and weighing that against what "it" means to society to prohibit "it" by shield ourselves from "it"-and I'm not just talking about this one specific example. My friends, there are as many "coulds" in this world as there are grains of sand on the beech; and I am growing tired of people-grant you they are often very well meaning people-desperate to guard everyone against the world around them. I'm not against safety-reasonable safety-but sometimes actions are taken to absurd lengths all in the name of "safety". My concern is not only what we have lost and now refuse to pass on to future generations, but that what we do pass on is a paranoia about the world around us and that most all dangers can be mitigated if we only lock ourselves away in metaphorical "rubber rooms" where the scary untamed world can't hurt us. We are already well on the way. I need a drink and an aspirin. Take a good look folks. Soon, it will only be a memory of what was; of what you were once allowed to enjoy. Tremors wrote: Well, they have done it. It is sad. I will miss it. A shorter slide? Waste of time. Kinda like, half of what it used to be like everything else in good old North Saint Paul. Had the opportunity last week to detour over to Silver lake, and it was a sad sight to see that grand slide gone, and just a lonely old tree left behind to mourn it. I wonder if there is a way to replace the spiral slide? 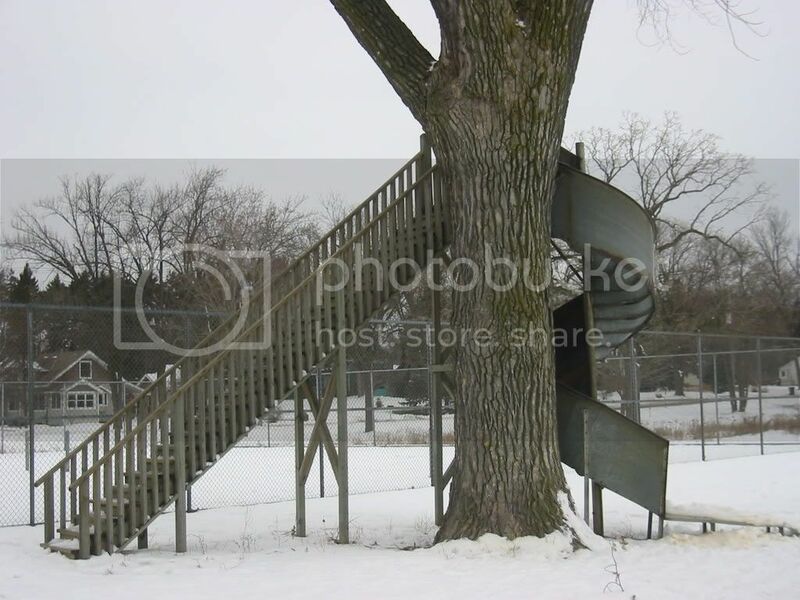 I wonder if there is a way to get a decent replacement for the old spiral slide? I believe the old one was built here in North St Paul by Standard Conveyor Company. Re: I wonder if there is a way to replace the spiral slide? Agitator wrote: I wonder if there is a way to get a decent replacement for the old spiral slide? I believe the old one was built here in North St Paul by Standard Conveyor Company. If I remember right, while I don't know who built it (Standard does sound reasonable), I believe it was actually used as a fire escape for one of the long gone manufacturers in NSP prior to being strapped to that tree by the lake. As for replacing it with a reasonable facsimile, it will not happen. The original was too big, too "scary", to be insured in this modern era. Too many people -- scared of their own shadows no doubt -- have such high levels of unreasonable fear that such a thing would not be allowed to be rebuilt, and as I said, without insurance coverage, the city's liability exposure would be too great. The slide is gone. I can't imagine a scenario when a repaired slide or a new version of the slide would return.